Musings of an Unknown Indian: UP, UP and (UP)AWAY... UPA Aala Re... !!! UP, UP and (UP)AWAY... UPA Aala Re... !!! NDTV, Times NOW and CNN IBN... all thought it would be the Behen... Haan ji... but 'Lady luck' said "Naa ji." Haathi roya... Barkha boli: "Ki hoya?" Haathi bola: "Rulake gaya sapna mera"!!! They said, the opposite of 'Progress' is... 'Congress'. No great shakes... said Manmohan... only high stakes. Aroon Purie is busy promoting a bird called 'Koel Purie'. Times NOW is trying hard... to be the Numero Uno Bard. Arnab said: "Mera number kab aayega...???" Rajdeep bola: "Tab aayega... jab hum jayega!" Arnab bola: "Jab We Met???" Then Pranoy replied: "This is not cricket... !!!" Shekhar ne TV pe bahut poll khola... but fell to the 'Shotgun'... Ooh La La! Or maybe the people voted for a Suman instead of a Shekhar... Ummm, bad P.J. Sidhuism topped while Khanna flopped. 'Boss' missed the bullseye by miles... and a Reddy was all smiles. Jaswant missed the 'sonshine'... as there was a cloudy sky. Elsewhere, a certain P.C. played a P.J. on a 'revered' Amma… who refused to say 'Mamma Mia'. And a few numbers got 'crunched'…'Yeh andar ki baat hai'… !!! 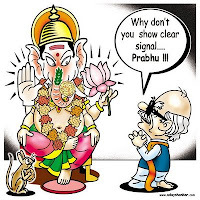 The 'Haathi' decided... enough is enough! It has too long a name… which changes the game... and settled for the 'Haath' ... all the same. No time for cherry picking! Haathis don't eat cherries, silly!!! So, the 'Mayajal' failed to catch the big fish... and settled for the small fry instead. It received a 'whitewash' from the 'Haath ki saafai'… and became a 'white elephant' in no time... !!! This is one clever 'Haathi'... I tell you! It felt, 'Haathi Mere Saathi' was out of tune and decided to go with the times... and realized that the 'Haath ke Saath'... was the best path. Amar is trying to make things 'Mulayam'... but 'King Cong' is playing rough and tough... !!! There was a 'pawar failure' too... which prompted an emergency landing... which is immensely better than crash landing... !! There... no 'pawar play'! Hmmm... too much 'Left' do not make a 'Right'... !!! The 3rd and 4th Fronts... hardly pulled any stunts. They and the NDA proved to be a 'NPA'... 'Non Performing Asset'. Thats the way... Mahiway... Oh, sorry, ... UPA(WAY)... ! Then, Lady Luck smiled and said "Jai Ho"... "Aagle paanch saal tum hi raho." Hilarious takes on the Poll 2009 - in India. Roshmi, you're brilliant! Not too many people can combine sharp analytics with caustic wit and generate a piece that's so amazingly funny, and so brilliantly accurate. But the real fun is about to begin... given the 'berth pangs'... perhaps I'll do a post on that as well. A funny, light hearted article. Nice play on words! Keep it up! Makes for some fun filled to the brim sort of reading. Good that we have a stable government. @ Rajdeep... Thanks a bunch!